Do not count a, of, the, and etc. Averaging the words in a line is O.K. I still think an idea needs between 400 and 500 words, but perhaps that is quibbling. 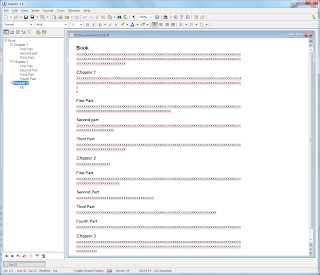 We now have word count, of course. See also: On the Size of a Thought. turned towards it all, never beyond! It fills us up. We put it in order. It falls apart. We put it in order again, only to fall apart ourselves. The clay tablet lends itself most readily to an abstracted shorthand notation, whereas, while well-drawn geometric figure may well have had their aesthetic appeal, they could not consistently be produced in clay. Algebraic problems were well suited to the writing media (p. 58). This presupposes not only that the Babylonians never drew figures in sand, on walls, etc., but also presumes that the writing media strictly determine what you can think and that you can therefore reduce thought to the tools by means of which you express these thoughts. I doubt that it is that straightforward. Tools provide affordances, making certain things easier than others, but they do not rigidly determine what approach we must take. You can use a grapefruit knife as a screwdriver, after all. Thinking new thoughts in a conceptual framework not to designed to express them requires unprecedented physical insights. In the history of physics few could sense the importance of things not yet expressible in current idioms, The task of the few has been to find means of saying what is for others unsayable (p. 107). Indeed! And this goes against the strict determinism he seems to advocate before. Furthermore, I don't think this is as rare as Hanson thinks. Isn't that what every person tries to do, who takes writing seriously, try to say what others could not say (whatever the reason for they inability may be). It's just that most of us don't succeed in going far beyond the current idiom of thought. The use of a certain kind of software application has something to do with this, but less than some people claim. Before we can attempt to measure anything we must have a preliminary ideal of what we wish to measure. But it would be most unwise to give that ideal a rigid definition at the outset, because the experience gained during the process of measurement should be allowed to react upon and refine the ideal" (p. 155). Just substitute "take notes" for "measure" and "taking notes" for "measurement." 1. This does not mean that I want to deny that computers allow us solve mathematical problems we could not have solved without them, just as I do not want to deny that a steam engine allows us to do things we could not have done with our muscles alone. That is, the main thesis of his book is not invalidated by this claim (I think). 2. This is also quoted by Bailey (from Lewis Richardson). I found the quotes the most interesting parts of the book. I came across a "post-it note" application last month, called Stickies. I have used such applications in the past, but not found them overly useful. This time around, it was different, as it fulfilled a definite need. Lately, I have been forgetting to take my pills against high blood pressure, etc (remembering only in the office where I have no pills). This application is a good reminder system. "The design goal behind Stickies is that the program is small and simple. Stickies will not mess with your system files, or write to the registry. Stickies stores information in a single text-based ini file." It is indeed "is beautifully implemented, well-documented and, astonishingly, it's free." You can put notes to sleep, set reminders and even attach them to different applications or documents. It is in this way just like GumNotes, though it does not automatically synchronize with your IPhone, MAC, Android or Internet. It also works together well with ConnectedText. If I save a note with the extension "sti", I can embed a link to the file in a ConnectedText topic. (If it would recognize ConnectedText URLs, it would be even better.) I also use it as a replacement for the AutoHotkey script that I reported about some time ago. Typing "Win+S" brings up a new note which stays on the desktop until you have dealt with it (meaning: have closed it). But mainly I just use it for reminders that pop up at the time when I need them. Probably something to do with age ... though I doubt it. Chapter by Chapter or "CbC" for short is a deceptively simple program. 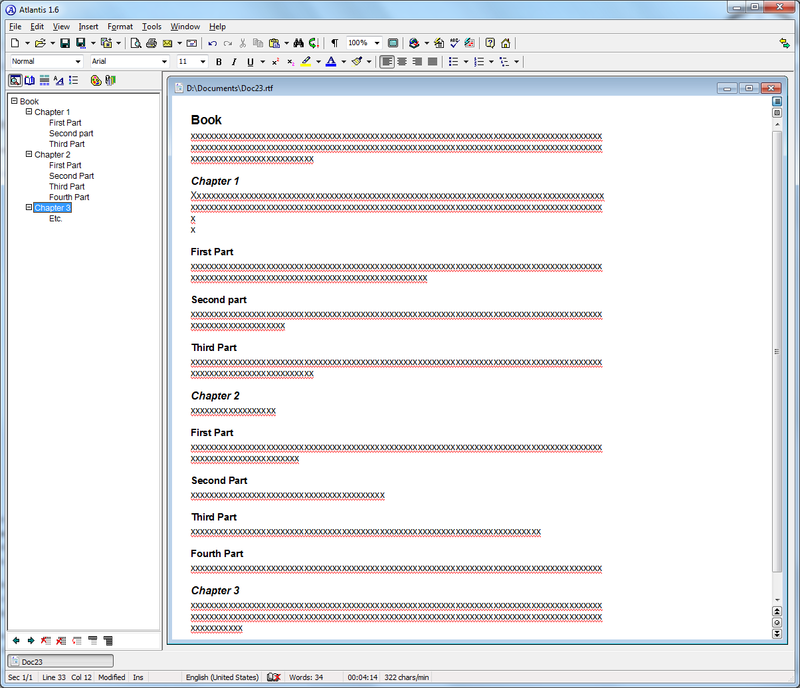 It is designed to work together with MS-Word: "It allows managing and organizing chapters within a book far easier than in Word just because it deals with one doc file per chapter rather than one big file containing the whole book. When the book is finished (or whenever the writer wants), CbC generates that big file." This is it: "Using CbC is pretty straight forward: a few menus, drag'n drop in the treeview, right-click on treeview items (act or chapter) to show their contextual menu, and double-click on a chapter to open it in Word. The only thing you should know: add the '#' symbol at the beginning of your chapters (in the .doc files) where the chapter number should appear, CbC will replace it with the correct chapter number." How closely is CbC wedded to MS-Word? Can you use another program to edit the files? no automatic update of the Page/word counts, you will need to trigger this update manually via the "Update Counts" function in the "Tools" menu. It works fine with Atlantis. It also works with Word 2002, of course. I did install it some time ago, even though I hardly ever use it. (But an installation of Word is necessary for CbC. Without such an installation, it cannot compile. 1. This information is based on the FAQ of CbC. See here. 2. Why did I install it? I tried out Writing Outliner, but I never really got it to work (as the help file was rather defective). It seems to try to hard to do too many things. Apparently, it does have a search function (which I could not test). Keys to the cloud castle is an interesting take on the recent dispute over privacy issues. I tend to agree with the position taken. If you must have real privacy don't rely on DropBox "out of the box," but use third-party encryption as well. Even better, don't use it for anything that you would not put into an e-mail message. Here the advertisement for OmniOutliner for the iPad, disguised as a review. I have nothing against advocating a certain program. I do this myself. But I have problems with calling a piece of "advocacy" a "review." As I am interested in programs for the PC and the Mac (and own an iPad 2 now), I have many occasions to compare the discussion of different products on both platforms. The problem of confusing "reviewing" (which should include at least an attempt at objectivity) and "advocacy" seems much bigger when Mac products are concerned. Mind you, this does not mean that I will not use OmniOutliner for the iPad, but the price is a bit prohibitive for an iPad application: $19.99 and there seems to be no Textexpander support. No DropBox support either. 1. Read the comments for some more critical voices. 2. The "review" points this out. Steve Zeoli, who is the author of the blog Welcome to Sherwood and has honored this blog with occasional comments, has written a long and informative review of Tinderbox. The fact that it has already been ripped off a few times without acknowledgment clearly attests to its quality. 1. There are also several entries on Tinderbox on his blog that are worth reading. Endorsement of the review does not mean that I would endorse Tinderbox. I would not use it, even if I still had a Mac. It did not agree with me; and I was not going to contort myself into the shape that was necessary to use it. I reported some time ago on why I switched from The Journal to Advanced Diary. One of the things I liked most was how it integrates with ConnectedText. Meanwhile, actually not long after that post. I imported the contents of the journal into ConnectedText. I have been happily using ConnectedText ever since for journaling. I have stopped using Scrivener. The inability to format block quotes easily makes it difficult to use the latest version (0.23). Apparently, the Mac version allows you to assign "Styles." I am using Atlantis again. It allows an outline of headings and has style sheets. I recently found out that OneNote has the ability to make wiki-links. Just as in ConnectedText and other Wiki applications, enclosing a word or phrase in double square brackets, like [[First page]], will link to an existing page with that name or allow you to create that page. There are "Powertoys" available that allow a primitive import of text files and primitive Search and Replace. You can "send" a document to MS-Word (and thus sort of export rtf). But all of this is highly inconvenient. and I have no desire to explore it any further. You cannot get accumulated information into the program (in an adequate way), you cannot get information out (in an adequate way), you cannot transform the information you manage to import (in an adequate way). This makes it an inadequate application—at least from my perspective. I might have been tempted, if I was just starting out with electronic note-taking, but it does not measure up to ConnectedText (nor even to other note-taking applications available for Windows). It is itself a "Powertoy," i.e. not suitable for serious note-taking spanning decades. 1. I would be amiss, if I did not mention one other feature I liked. The Ribbon is mercifully out of the way. Apparently, Microsoft listened to complaints: "in order to conserve space, we decided to ship OneNote 2010 with the ribbon collapsed." 2. I have used ConnectedText now for almost six years. It is much more capable than OneNote 2010 (and it keeps getting better). The markdown-like wiki markup has become second nature. I consider it another advantage.